Gas, oils and chemicals are sensitive quality products. This is why the responsibility for the crew, cargo, ship and environment has always been a top priority for Chemikalien Seetransport G.m.b.H. Our highly qualified onshore and onboard staff ensures reliability as well as the technical and commercial operation of our fleet. 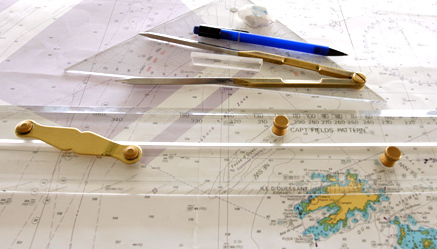 We manage both our own and third-party ships. We also expect the highest standards from our crew management. Only a well-qualified crew can act consciously and confidently even in difficult situations. Our responsibility does not end at our workplace. The foundation set up by owner Peter Krämer has committed to improving long-term educational opportunities for children in Africa. Chemikalien Seetransport (CST) is a family-owned company founded by Dr. Karl-Heinz Krämer in 1969. 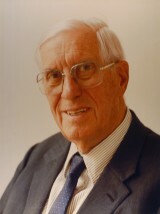 His son Peter Krämer took over as chairman in 1987. Christian Krämer, the third generation, joined the company in 2013. CST has been established as a subsidiary of the engineering consultancy firm Marine Service, now a sister company of CST. Marine Service started exploring new territories in the mid-1960s by developing a chemical tanker with stainless steel tanks. The 1969 built “Chemical Sprinter”, a 2,500-dwt chemical tanker designed by Marine Service, was the first vessel under management by CST. Chemtrans Crewmanagement GmbH, a 100 % subsidiary of CST, is handling crewing services since 2009. Belchem Philippines Inc. was incorporated in 2006 as a joint venture for crew management between CST, Belships and United Philippine Lines. CST´s subsidiary Chemikalien Seetransport Cyprus Limited based in Limassol was founded in 2003. Chemikalien Seetransport Cyprus Limited primarily acts as a commercial ship manager. 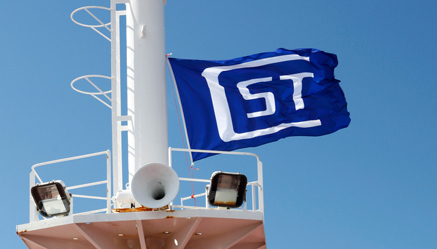 In 2004, CST entered into a joint venture called CST Belchem Singapore Pte Ltd, which provides technical management services with its Norwegian partner Belships. Chemikalien Seetransport Cyprus Limited is the 80 % majority shareholder. Dr. Karl-Heinz Krämer GmbH is the holding company for its main operational subsidiaries Chemikalien Seetransport G.m.b.H., ITE Solutions GmbH and Marine Service GmbH. Marine Service, founded in 1958 by Dr. Karl-Heinz Krämer, is one of the world´s leading engineering consultancy companies in the LNG and LPG sector. Chemikalien Seetransport benefits from Marine Service extensive experience in the field of marine engineering, ship construction and design. 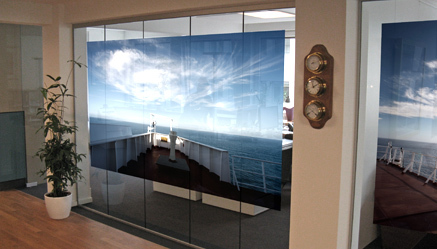 Both companies work closely together on a wide range of projects. The foundation of Chemikalien Seetransport G.m.b.H. was laid by an engineering consultancy firm from Hamburg: Marine Service GmbH, now a sister company of CST, started to explore new territory in the mid-1960s by developing a chemical tanker with stainless steel tanks. The ‘Chemicoaster’ was followed by other designs. The launch of the third new tanker ‘Chemical Sprinter’, a 2,500-tdw chemical tanker, was the inception of Chemikalien Seetransport GmbH in 1969 and the company has been focusing on professional ship management ever since. 1958: Inception of Marine Service GmbH. 1969: Inception of Chemikalien Seetransport G.m.b.H. 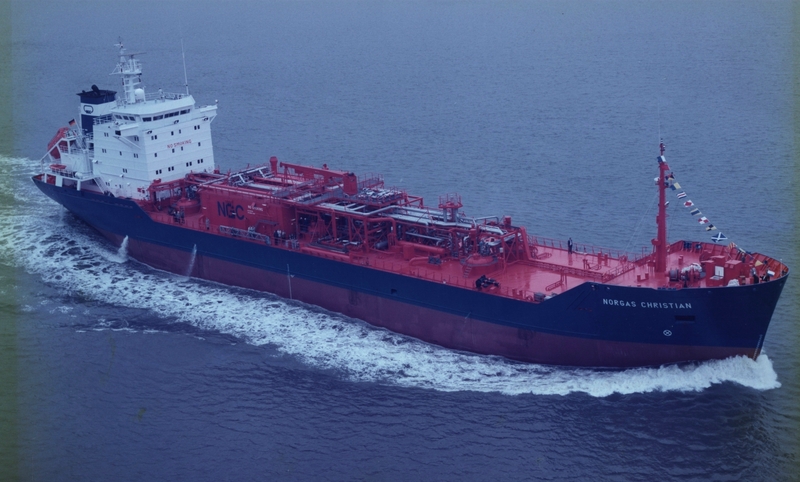 1975: CST launches its first LNG tanker ‘Isabella’; specialization in the management of liquefied gas and oil tankers. 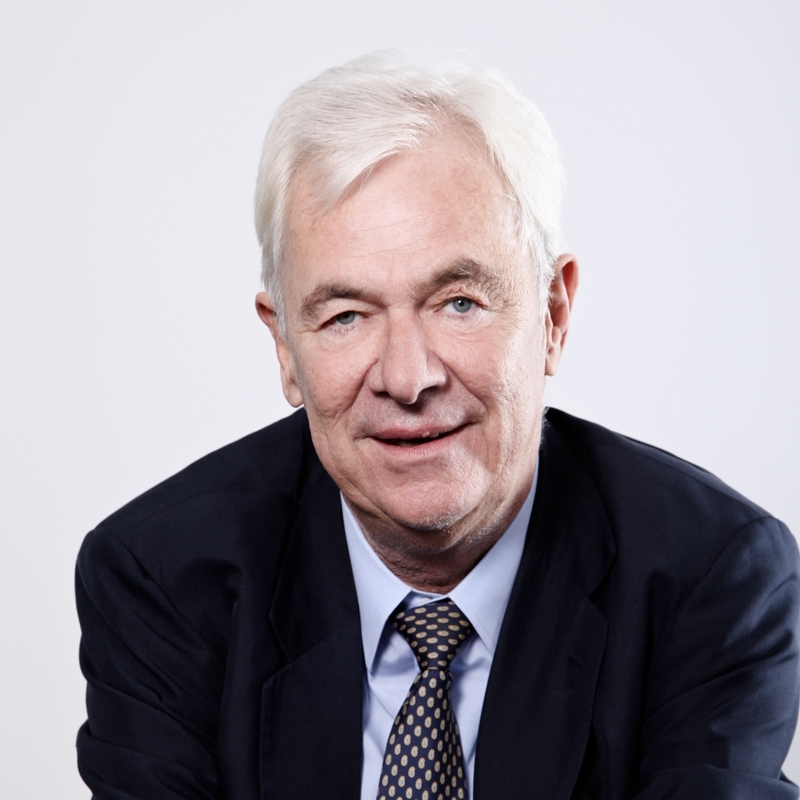 1982: Peter Krämer joins the Krämer Group of Companies. 1983: CST develops expertise in dry bulk operations with the acquisition of the OBO carrier Bel Ocean. 2003: Foundation of the subsidiary CST Cyprus, based in Cyprus. 2004: Foundation of CST Belchem Singapore as part of a joint venture with the Norwegian bulk shipping company Belships ASA. 2006: Foundation of subsidiary Belchem Philippines as part of a joint venture with the Norwegian bulk shipping company Belships and UPL. 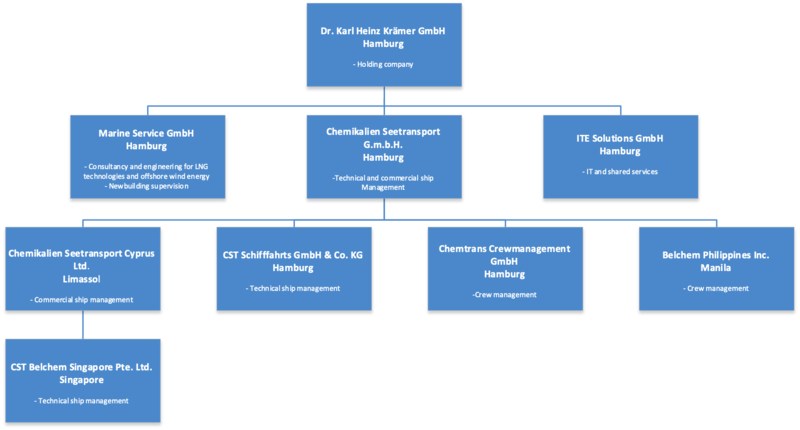 2009: Foundation of subsidiary Chemtrans Crewmanagement GmbH. 2013: Christian Krämer joins the Krämer Group of Companies. 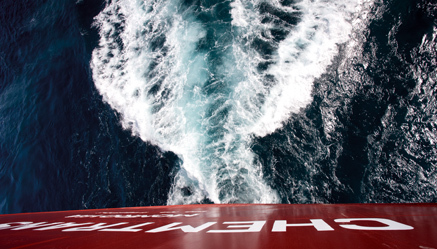 Chemikalien Seetransport GmbH has been managing the nautical, technical and commercial operations of tankers and bulk carriers for nearly 50 years. For us, this tradition involves an enormous responsibility, continuous learning and, with it constant improvement in the quality of our services. Our corporate independency forms a solid basis for long-standing customer and business relationships. We endeavor to deliver the best quality while complying with the existing regulations and standards. The safety of life, health, environment and property has top priority in our day-to-day work. Our success is based on the expertise of our employees. We encourage fairness, equal opportunity and possibilities for continuous learning. Social responsibility is an integral part of our corporate culture. In keeping with this commitment, over 1300 schools have already been built in 13 African countries as part of the “Schools for Africa” program, a joint initiative between UNICEF, the Nelson Mandela Foundation and our foundation, the Peter Krämer Stiftung. Marine Service is the consulting engineering company within the Krämer Group, specializing in maritime applications in the field of “LNG as Fuel”, LNG transport and offshore wind power converter platforms. For new ships and ship conversions, Chemikalien Seetransport uses the know-how of Marine Service, which has been built up since 1958 with a wide range of “pioneering solutions”. Chemikalien Seetransport is delighted to have a competent partner within the company group that can use its knowledge of the fleet to develop technical solutions quickly and competently.